University of Toronto wins top International Team Award at the 2017 PanAm! 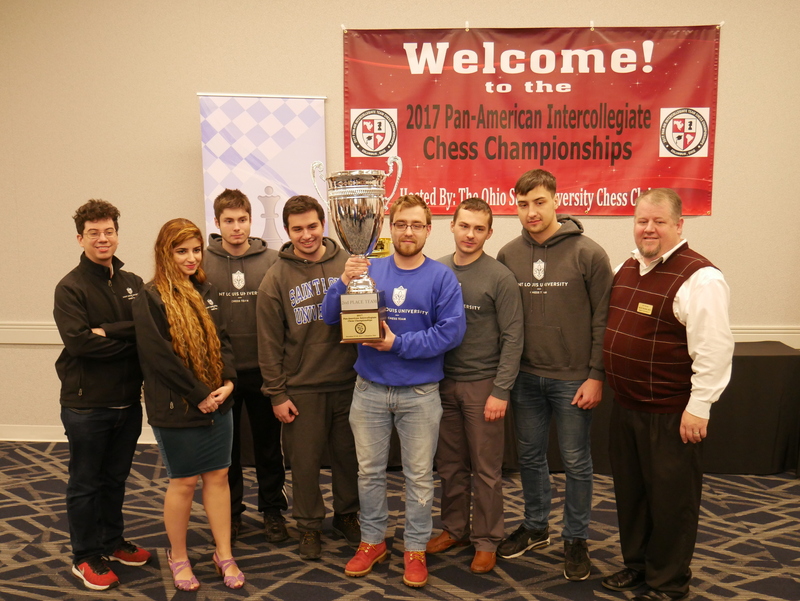 The 2017 Pan-American Intercollegiate Team Chess Championships (Pan-Am) was held in Columbus, Ohio December 27-30. It was the 64th time this tournament was being held and someone said this would make the event memorable, for 64 are the squares of the chess board! The 2017 PanAm was held at Hyatt Regency in Columbus, Ohio! Indeed, to give just two examples, four teams from Webster University and five teams from the University of Texas at Dallas flew to Columbus this year. Each Pan-Am team has four players (called “four boards”) and may have up to two alternates. Hosted by Ohio State University and the amazing Kelly Bloomfield – organizer, tournament director, DGT broadcaster and advisor – this year’s event was a very competitive one as it hosted 58 teams (but not as many schools since some universities fielded multiple squads), featuring 28 Grand Masters and 16 International Masters! Everything from Ivy League schools to community colleges participated. They came from as far north as Alaska Pacific University in Anchorage to as far south as the National Technical University of Mexico, based in the capital. As always, University of Toronto was represented by two teams and eight players, with Hart House Chess Club’s Coach and Director of Communications, Panayoti Tsialas, as captain of the delegation. 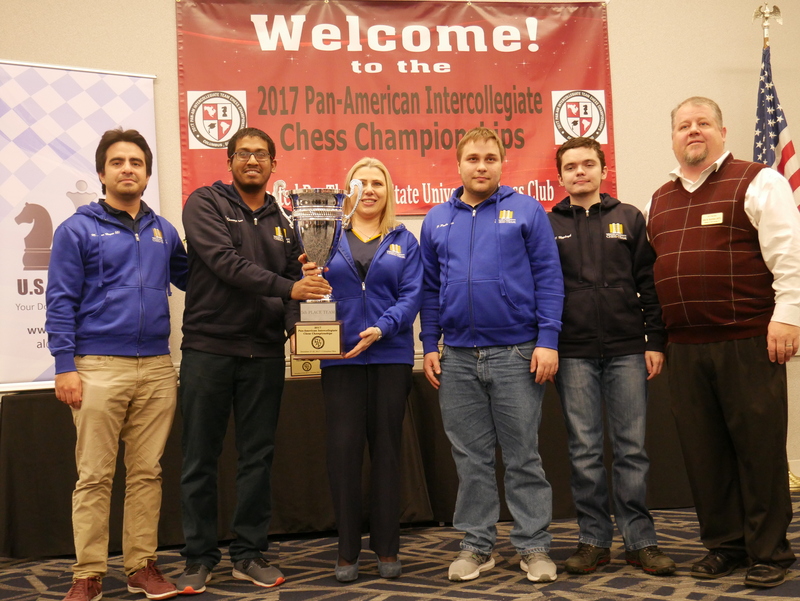 After six exciting rounds, Webster University’s Team A became the clear winner of the 2017 Pan-American Intercollegiate Team Chess Championships (Pan-Am)! For the past five years, the dawning new year has brought Webster at least a share of first place at the end of the premier open college team tournament. This year, their top team made it six, a remarkable streak which eclipses the previous record of five in a row, set from 1998-2002 by the University of Maryland, Baltimore County. However, UMBC and the University of Texas at Dallas are still tied for most all-time wins (10 apiece) but Webster is now six-for-six since their inception in 2012. In round 5, Webster’s A team tied its match with the UTD B team. Since Webster A had been the only team going into the round with a perfect 5 out of 5 match wins (UTD B had 4½ of 5 going into the last round), a tied match was sufficient for Webster to win the tournament. All the games in the UTD B vs. Webster A match were draws. 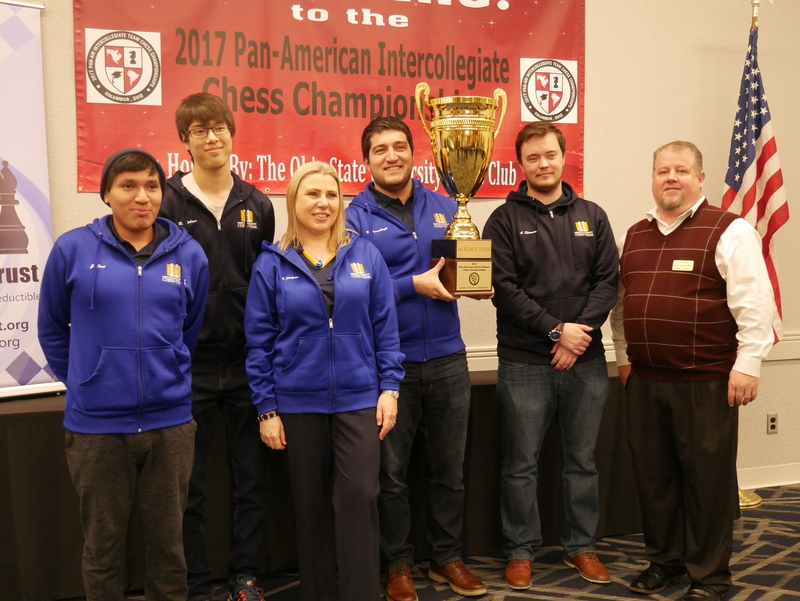 However, the tournament winner title was not all that was at stake in the last round, as the top four U.S. schools (colleges or universities) qualify for the President’s Cup, also known as the “Final Four of College Chess,” to be held March 30-April 1, 2018 in New York City. Since Webster “A” won the Pan-Am, Webster University became one of the “Final Four” schools. However, as the last round began, many other teams could finish tied with each other with five out of six match wins. When it tied its last round match with Webster “A,” UTD “B” went from 4.5 to 5 match wins. On the second table, SLU was playing Harvard Crimson, which was led by GM Darwin Yang. Both teams had four match wins going into the round. Playing Black, Yang drew against SLU’s first board, GM Ipatov. However, SLU clinched the match by a 3 to 1 score by drawing on Board 2 and winning on Boards 3 and 4. St. Louis (left) vs. Webster A-team (right) in the critical round five. Webster Coach Susan Polgar observes. Our own U of T Team A finished with 3.5 points out of 6 games, losing only to UTD’s Team A and Webster’s Team B, both of which are made-up exclusively of Grandmasters. This performance earned our University the precious trophy of Top International Team, despite the tough competition with other International Teams (e.g. from Canada, Mexico etc). Univ. of Toronto A was the proud winner of the Top International Team Award! Also good was the result for the Team B, which scored 2 out 6, missing at least two opportunities to score even more but still climbing higher than its starting rank in the final standings! “Cheese!” UofT B’s players are smiling at the camera! All of the top nine teams are “scholarship schools” and invest heavily in hiring renowned coaches and in recruiting and training student athletes from all over the world. In fact, some of Canada’s strongest players, such as Grandmasters Anton Kovalyov and Razvan Preotu as well as Edward Song, have joined the chess teams of these well-endowed American Chess Universities. “My concern for our team is being able to keep someone once they reach GM status”, wrote Steve Wolk, Chess Manager for Lindenwood University. “Other schools can offer huge scholarships that I cannot do.” Lindenwood’s Board 1 used to be GM Priyadharshan Kannappan, back when he was an IM. Now, however, Kannappan plays for Webster University. The highest-finishing schools that do not offer robust chess scholarships all tied with 4.0/6 and finished from 10th place onward: University of Michigan, Harvard University, University of Chicago (two teams with 4.0/6), Arizona State University, and the University of Illinois. Canadian GMs Anton Kovalyov and Razvan Preotu are both playing for UT Dallas! During the early rounds, two teams new to the Pan-Am caught our eye, literally. Alaska Pacific University (Anchorage, AK) intended to have a four-person team but one player could not make the trip due to a family emergency. Participating were Board 1 Jonathon Singler, Board 2 Carson Kent, and Board 3 Emily Smith. The team had a rugged outdoor look suitable for representing a university from “the last frontier” state. For round 1, each player wore a gray long-sleeved shirt with the school logo and the men wore suspenders. For round 2, the players had furs around their necks and the men had plaid, flannel, lumberjack-style shirts. After their games, all three players would lose their fancy outfit, replace it with their bathing suits and go straight to the hotel swimming pool! Stylistically speaking, Alaska Pacific really set itself apart from any competition! In contrast, players from Northwest University (Kirkland, WA) wore blazers and dress shoes. The Northwest University chess club president is Phiona Mutesi. Her life story was told in a book that then became the basis for the Disney movie “Queen of Katwe”. Mutesi plays second board behind chess expert Benjamin Mukumbya, who also has a counterpart in the Disney film. Rounding out the team is third board Walter Borbridge, who is from Sitka, Alaska, and is one of a few hundred Tlingit speakers in the world. The fourth board is Andrew Uptain, who is a community college transfer to Northwest University and the only non-freshman member of the team. Northwest University paid for the team’s travel, hotel, entry fees, food, and uniforms, according to Northwest University President Joseph L. Castleberry, Ed.D. “In the Pan-Am, Northwest University students have the opportunity to play superior players and grow in their chess skills”, said Castleberry, who is looking forward to the chess club and chess team expanding in the coming years! Finally, aside from University of Toronto, this year’s PanAm saw two more Canadian Universities participating, Queen’s University and Western University! Led by the always friendly Simon Gladstone, Queen’s even managed to win one of the tournament’s team awards! Just as – if not even more – impressive was the participation of Universidad Tecnologico Nacional de Mexico with three (!) teams, whose Team A put up a strong fight against but ended up losing to our own Team B for round 5 of the tournament. The hospitable organizer of the 2017 PanAm, on behalf of Ohio State, was Kelly Bloomfield. In a phone interview he gave before the Pan-Am, Bloomfield said that the two largest Pan-Ams in history (108 teams in 1972 and 123 teams in 1975) were in Columbus. While the Pan-Am is not as popular now as it was during that “Fischer Boom,” Bloomfield was hoping for a turnout as big as the 60 teams at the 2016 New Orleans Pan-Am and indeed he made it! 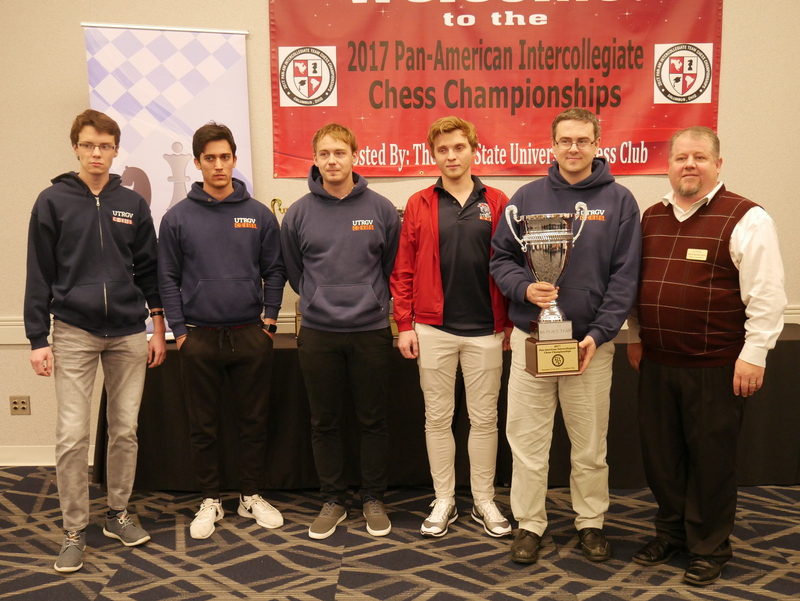 As the Chess Advisor for Ohio State, Bloomfield assembled two teams for the 2017 Pan-Am. Bloomfield’s multiple Pan-Am roles (organiser, tournament director, DGT broadcaster, advisor) convinced him to take the week of December 25th to January 1st off from his full-time job as building automation manager. His dedication to the organization of the tournament really paid off! Indeed, everything was wonderfully organized! The teams were accommodated at Hyatt Regency, a beautiful and fully accessible luxury hotel, conveniently located just a 10-minute drive from Columbus International Airport. The hotel had indoor access to the playing hall and offered a wide choice of food places, where the players could take their breakfast and lunch. This amenity proved very convenient, given the Narnian December temperatures in Columbus. The most impressive thing about the tournament organization, however, was the breathtaking playing hall. The incredibly spacious and bright Greater Columbus Convention Center is an architectonic wonder of modern design. It featured more than 10 rooms – one for the games, one for live broadcasting, one for analysis, another one was reserved for the Webster Teams to Practice etc – and ample space for the players to feel more than comfortable during the competition. We were really impressed when we first saw the playing venue during registration and the Opening Reception. Bloomfield spent $5,000 on a menu that included hors d’oeuvres and pulled pork sliders. Could the playing hall get any better than the Greater Columbus Convention Center? All games started exactly on time and the organizers generously introduced new categories of outstanding team and individual performance, for which they awarded prizes! 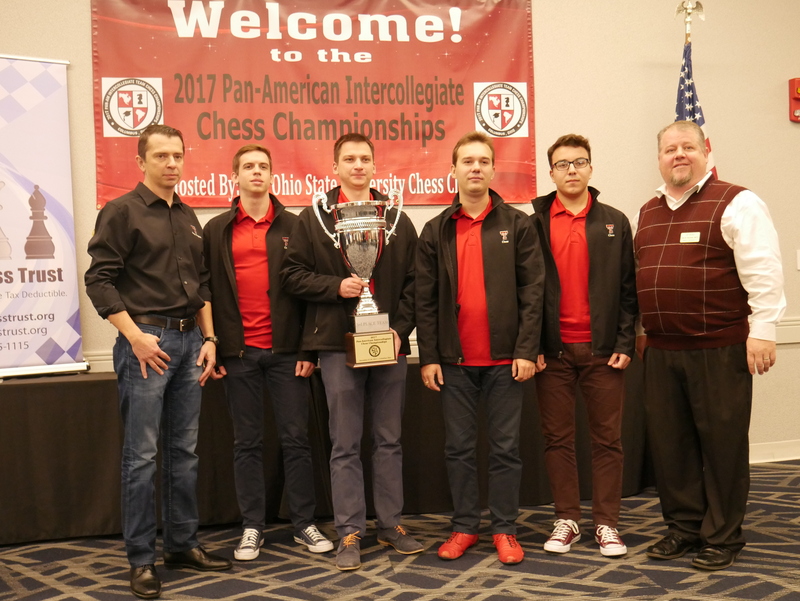 At the end of the tournament, in lieu of a souvenir, each participant received a vinyl, 2017 PanAm chess board with the scarlet and gray Buckeye logo! Scarlet and gray are the official colors of Ohio State and its residents are known as Buckeyes (as are the sports teams at Ohio State). This year’s Award Ceremony was pretty shiny! 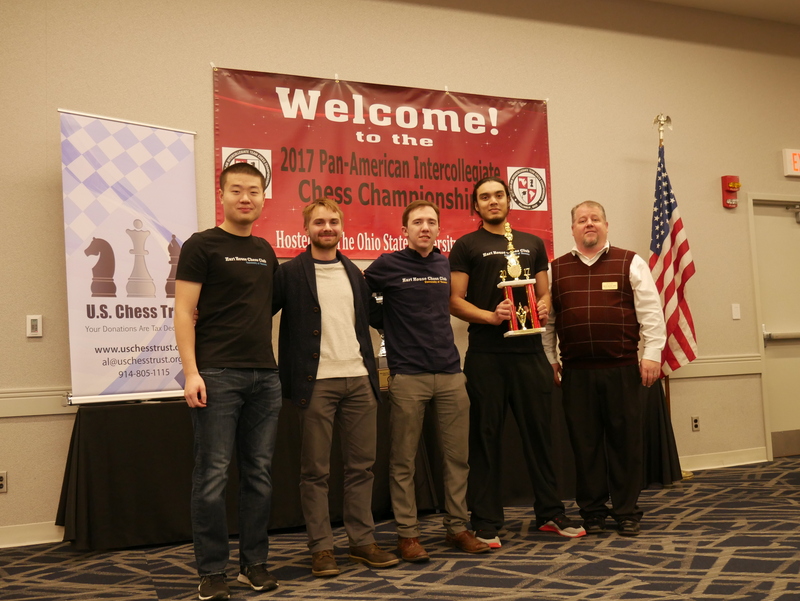 Of course, the tournament would not have been such a great success without the work of a group of people, including – first and foremost – Kelly Bloomfield but also College Chess Committee Chair Al Lawrence, Chief Floor Tournament Director Kathy Lin and Chief Tournament Director Grant Perks. The Executive Board of University of Toronto’s official Chess Team would like to pass their warm and grateful thanks to the team of hosts for their hospitality, hard work and exemplary organization. Our small suggestions for making the tournament even better in the future would be to improve the official website of the tournament. For example, the presentation of the results/pairings could look better and be more user-friendly, a photo gallery could be added etc. Other than that, the tournament was perfect and our University’s Chess Club is looking forward to visiting Columbus again in the future! And the Oscar goes to….! Next year’s PanAm will be held in San-Francisco, California, Dec. 27-30! Need I say that we can’t wait to participate? Next 2018 CUCC: A Tournament for 5 U of T Teams!